There are four generally recognized mountain horse registries. 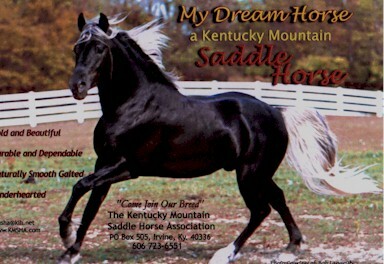 The three non-spotted registries include the Kentucky Mountain Saddle Horse Association (KMSHA) which has the largest number of registered horses, the Rocky Mountain Horse Association (RMHA) with the second largest registry population and the Mountain Pleasure Horse Association (MPHA) with the smallest. In addition to these non-spotted registries, there is also a Spotted Mountain Horse Association (SMHA) for spotted mountain horses. Each of the registries has their respective membership, registration and show requirements. A "single registered" Mountain Horse has met the registration requirements of one of the foregoing registries (e.g. RMHA). A "double registered" Mountain Horse has met the registration requirements of two registries (e.g. KMSHA and MPHA) and a "triple registered" mountain horse has met the requirements of KMSHA, RMHA and MPHA. Most of our horses are double or triple registered or eligible. Each Mountain Horse has a natural "way of going" which should neither be obtained nor enhanced with harsh or artificial training devices or techniques. The "way of going" does not refer to how smooth the horse gaits or the use to which the horse is to be put (such as trail riding or showing), but rather the characteristics of the horse's gait and the animation with which the horse travels naturally. An educated buyer wants neither a horse that will do too much nor one that does not do enough. He or she will be uncomfortable with the horse that does too much and bored with the horse that does not do enough. We try to determine your preferences, riding abilities and expectations for the horse and then match you with a mount that will meet your needs. 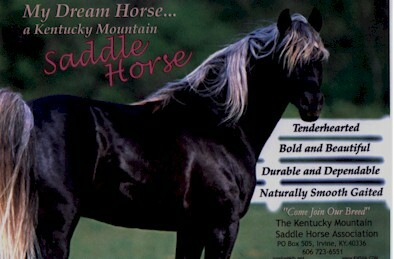 Most of our customers are looking for smooth-gaited trail horses. Both the trail pleasure horse and the classic pleasure horse are well suited for the trail, depending upon the preferences of the rider. These horses are great on the trail and they can also be shown in their own classes against similarly gaited horses. Park pleasure horses are also fine on the trail for the experienced rider who wants animation and "a big front end." We would be happy to give you a tour of the farm and tell you more about these wonderful horses.